Welcome to our Support Center. Learn everything you need to know about Prose. I want Prose to propose topics for my content. How does the process work? You are not alone. One of the most common challenges of content creation is coming up with fresh topics day after day, week after week. Prose makes it easy. Let us come up with topic ideas for you—for free. Topic pitching is completely optional and available for blog posts, bylined articles, and white papers. If you choose the latter option (“No; I want Prose to pitch topics”), just give us a general idea of the kind of topics you're looking for, and we’ll do the rest. Each topic will include a potential title and a brief description. Review these options and decide which topic you like best. If you like more than one, don’t worry. You can choose one for the current project, and save the other topics for later. 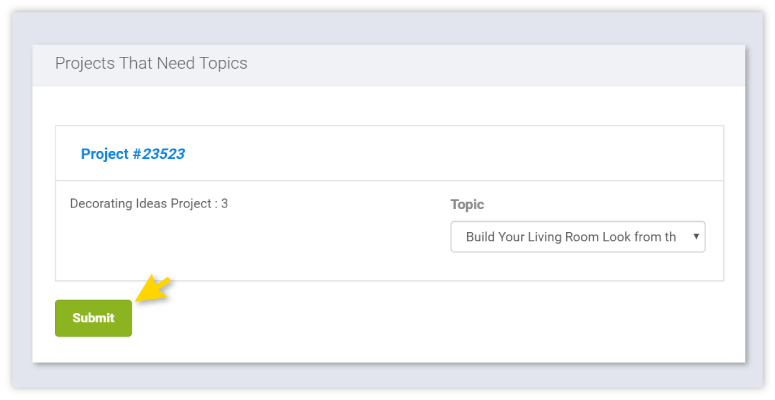 Pick your favorite topic and click the Approve button to approve that topic for the current content project. Then click OK to confirm. Note: If you take no action at all on a given topic, it will be moved to the “Topics to Review” section. Think of this as a “waiting room” for topics that have been neither accepted nor rejected. What do the other buttons do? Add to Queue: Like more than one of the topics pitched? Choose your favorite and click Approve. Then select any others you like and click Add to Queue. These ideas will move to the “Queue of Approved Topics (To Be Assigned)” section of the page for future project selection. Reject: Not crazy about one of the topics we pitched? Just click this button to send the topic to the “Archived Topics” section. Once you’ve chosen a topic for the current project, Prose will create the content and notify you when the draft is ready — just as we would with any other assignment. Note: If you request topic pitches from Prose, the turnaround window for the project does not begin until you have chosen a topic. For example, if you placed an order requesting topic pitches on Monday, but did not approve a topic until Thursday, the turnaround period (e.g., five business days) would begin on Friday (at 9 am ET). Will requesting topic suggestions affect the delivery date of my content? Yes. Topic pitching can add up to two (2) business days for us to develop the pitches and up to three (3) additional business days, depending on the time you need to review and select. Note: The turnaround period for the content does not begin until you have selected a topic. For example, if you order a blog post with a turnaround time of five (5) business days, the turnaround period does not start until you have either selected a topic, created a topic yourself, or assigned a topic stored in your topic queue. How does the timeline for topic pitches work? If you order a project for which you request topic pitches, Prose has two (2) business days to pitch topics, starting at 9 am ET on the business day after you place the order. We deliver the topics by 6 pm ET on the second business day. Upon receiving topics, you have up to three (3) business days to choose a topic, starting at 9 am ET on the business day after you receive the topics. For the convenience of everyone involved, if you don’t make a selection by 6 pm ET on the third business day, we will remove the writer from the project and the order will be cancelled. I just received my topic pitches. How long do I have to review them? Note: Your review period begins at 9 am on the first business day after you have received the topics (e.g., if you received them on a Tuesday, your review period starts on Wednesday). Your project will not kick off until you approve a topic — the sooner you make your selection, the sooner we can begin. What happens if I receive topics but don’t select any of them by the deadline? If you do not select a topic within three (3) business days, for everyone's convenience, we will remove the writer from your project and your project will be automatically canceled. Note: If you feel that three business days will not be enough time to review and approve topic(s), please do not request topic pitches. What if I don’t like any of the proposed topics? We do our best to come up with compelling topics, but we realize that occasionally they might miss the mark. If you do not like any of our topics, we make it easy for you to propose your own. 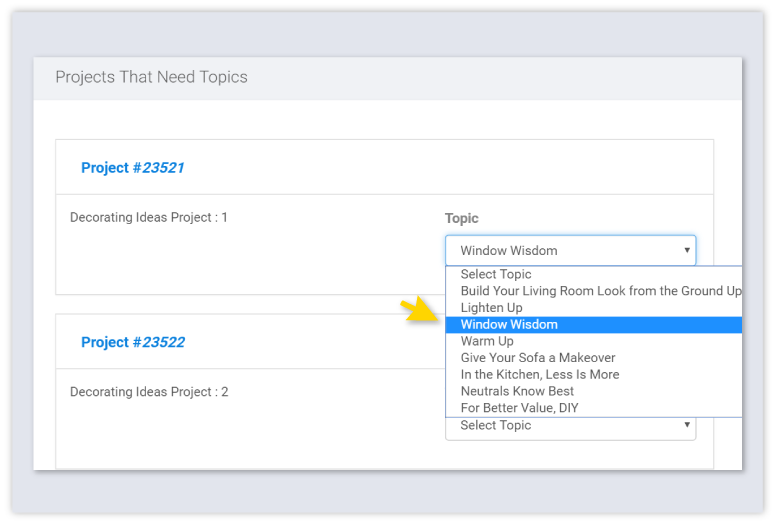 Click the Edit button next to any of our suggested topics and simply write a new title and description. When it reads to your satisfaction, be sure to click Save. 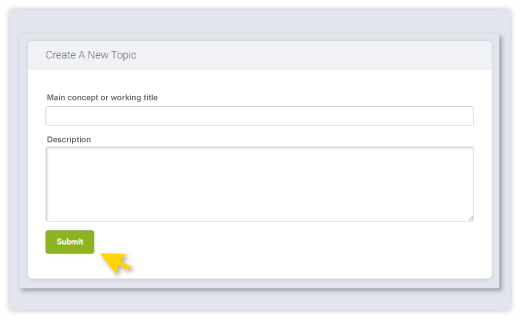 Now, back on the Topics page, click the Assign button next to your newly written topic. Note: You can also propose your own topic by clicking the Create a New Topic button and following the steps. Alternatively, you can also make a selection from any of the topics that you’ve saved in your Queue for later use. You can find these in the “Approved Topics (To Be Assigned)” section. Who creates the topics pitched by Prose, and how do they know what to pitch? From the information in your content brief, Prose identifies the best writer for your needs based on a number of criteria, including relevant industry expertise. This writer will often be the one to pitch topics. In other cases, your Prose editor may come up with topics. 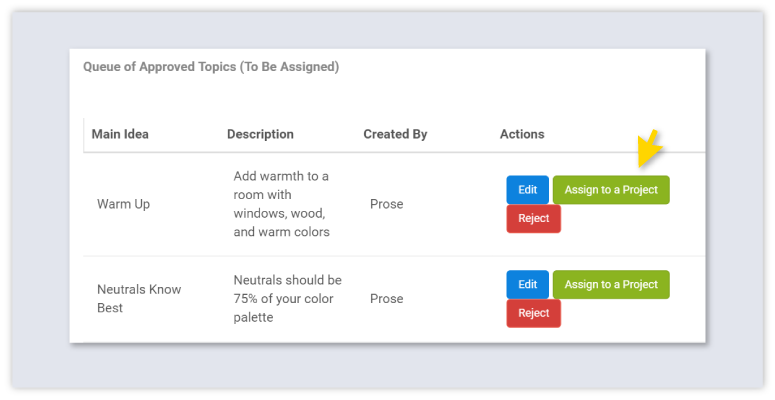 Prose relies on a range of best practices for topic selection. We carefully consider your content brief, website, and other any materials you’ve supplied, and tailor the topics around your brand and objectives. We also rely heavily on online research — from targeted searches to social media tracking to industry blogs and websites. In short, we do everything we can to pitch topics that are timely, substantive, and valuable to your target audience. Where can I view a complete list of topic suggestions? The Topics page is a “waiting room” or queue for topics suggested by you or by Prose that have not yet been assigned to a specific project. To view the Topics page, sign in to Prose and click the Topics tab on the left-hand navigation bar. Note: Use of the Topics page is completely optional. If you prefer to supply your own topic(s) in the content brief, you will not need to use this section. On the Topics page, what is the “Topics to Review” section? The “Topics to Review” section is a sort of “waiting room” for topics that haven’t yet been accepted or rejected. If, after receiving topic pitches for a project, you take no action at all on a given topic, the topic will be moved to “Topics to Review." From here, you can edit them, reject them, or add them to the official queue for future use. Edit: You may like the topic but want to make a few small changes. Click this button to edit the topic’s title and/or description. Add to Queue: These topics will move to the “Approved Topics (To Be Assigned)” section for future project selection. Reject: Not crazy about a topic? Just click this button to send the topic to the “Archived Topics” section. On the Topics page, what is the “Queue of Approved Topics (To Be Assigned)” section? In this section, you'll find topics that are waiting in the queue to be assigned to a new piece of content (e.g., blog post) that you order. Example scenario: You liked several of our topic pitches. You could only pick one, so you clicked Add to Queue for one or more of the others. They now appear in the “Queue of Approved Topics (To Be Assigned)" section. Feel free to assign any of the topics in this queue to an existing content order that needs a topic. 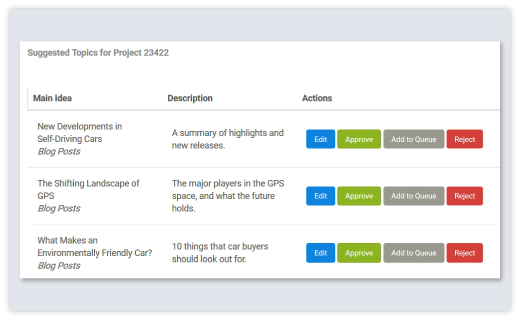 Assign to a Project: Ready to use one of the topics you’ve saved? 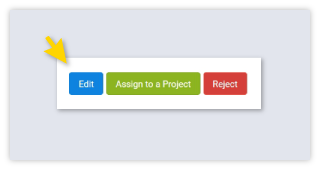 Click Assign to a Project. Reject: Changed your mind about a topic? Decided you don’t like it so much after all? Just click this button to send the topic to the “Archived Topics” section. On the Topics page, what is the “Archived Topics” section? 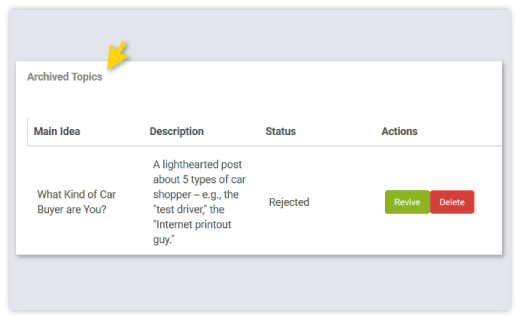 “Archived Topics” is a reference section that contains topics that have either been rejected or used in a previous order (clearly labeled “Rejected” or “Already Applied”). Never want to see the topic again? Click the Delete button to permanently remove. Like it more than you remember and want to put it back in circulation? Click Revive to move it to the "Topics to Review" section. I have a great idea for content. How do I create a new topic? When inspiration strikes, Prose is ready. Simply log in to the Prose platform and add the new idea to your topic queue. Whenever the time is right, the new topic will be waiting for assignment. 1. Click Topics (on the left-hand navigation bar). 2. Click Create a New Topic at the top right-hand side of the screen. 3. Fill out a topic title and description, then click the “Add New” button. How can I use one of the topics saved in my queue — i.e., in the "Queue of Approved Topics (To Be Assigned)" section? 1. Click “Topics” (on the left-hand navigation bar) to visit the Topics page. 2. 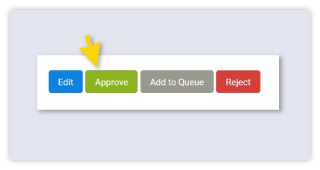 In the section of the page called “Queue of Approved Topics (To Be Assigned),” locate one of the topics you want to use and click the Assign to a Project button beside it. Can I assign multiple topics from the main Topics page? 3. Using the “Topic Name” drop-down menu for each project, make your topic selection, being careful to avoid any duplicate assignments. Each project must have a unique topic. 4. Click the Submit button. Your topic(s) are now assigned to the indicated project(s). Join now and get great content without the hassle. No credit card necessary.